Two bedroom bungalow just on the edge of historic downtown Wilmington. Covered front porch. Many great updates have been made! Laminate flooring in common area. Large living room open to eat-in kitchen with black appliances and stylish backsplash. Enclosed laundry. Master bedroom has walk-in closet. Shared full bath. Fenced rear yard with detached storage shed. Close to New Hanover High, Cape Fear Museum, Jengo's Playhouse, daily shopping and dining conveniences. Move-in ready townhome in Charleston-style River Pointe community. Unit offers three bedrooms, two full and one half baths. Open common area includes combination living and dining space, kitchen, sliding door access to rear deck. Features include wood flooring & neutral carpet, wainscoting, crown molding. Single car attached garage. Waterfront community includes swimming pool for residents to use. Close to area beaches, golf, River Road Park with playground & public water access, the Pointe at Barclay complex with shopping, dining, and entertainment. Beautifully maintained single family home in Lake Brewster subdivision built in 2008 offers 3 bedrooms and 3 full baths. Covered front entry. Large combination living & dining space open to kitchen with breakfast bar. Features include hardwood flooring and gas fireplace. Bedroom on first floor could be second master. Master suite with walk-in closet, attached bath, and home office upstairs. Third bedroom and large bonus room round out the second floor. Bedrooms each have carpeting. Beautiful brick home in new Cottage Grove community, convenient to Mayfaire Shopping Center, Ogden Park, Wrightsville Beach, UNCW. Cedar shake dormers, shuttered windows accent the brick exterior. 2-car side load garage and covered front entry among exterior features. Beautiful brick home on cul-de-sac street in gated community. Foyer, living room with vaulted ceilings and gas log fireplace, formal dining room, eat-in kitchen with granite counters, separate laundry room among common areas. Master suite has large walk-in closet and attached bath with double vanity, soaking tub, stall shower, glass block detail. Two additional bedrooms share full hall bath. Cottage home built in 2013 offers two bedrooms, one full bath, open common area. Laundry closet in kitchen. Carpet and laminate flooring. Rear wood patio in fenced backyard with storage shed. Off-street parking. Great investment with rental potential! No HOA. Close to Wilmington Airport, Archie Blue Community Park, VA Health Center. Short drive to all the shopping, dining & entertainment downtown Wilmington has to offer! 10 miles to Wrightsville Beach, 20 miles to Carolina Beach, 30 miles to historic Southport. Level, quarter acre buildable lot in desirable, golf cart friendly Pleasure Island community! Brick homes & patio homes comprise this neighborhood, which offers marina access to ICW. Wonderful location for seasonal residence or investment property! Short drive or ferry ride to diverse shopping, dining, recreation nearby. Close to Carolina Beach State Park, Fort Fisher Aquarium, Carolina Beach Boardwalk. Single family home ON 5 acres in Rocky Point offers 4 bedrooms and 3 full baths across 1.5 stories. Exterior features include covered front porch, attached carport, rear deck. Step-down living room upon entry with fireplace and hardwood flooring open to large dining area and kitchen which includes a gas cooktop and wall-mounted oven. Three bedrooms on main floor, one includes built-in shelving. Master suite on upper level with full bath. Separate laundry room, pull down stairs for attic access. 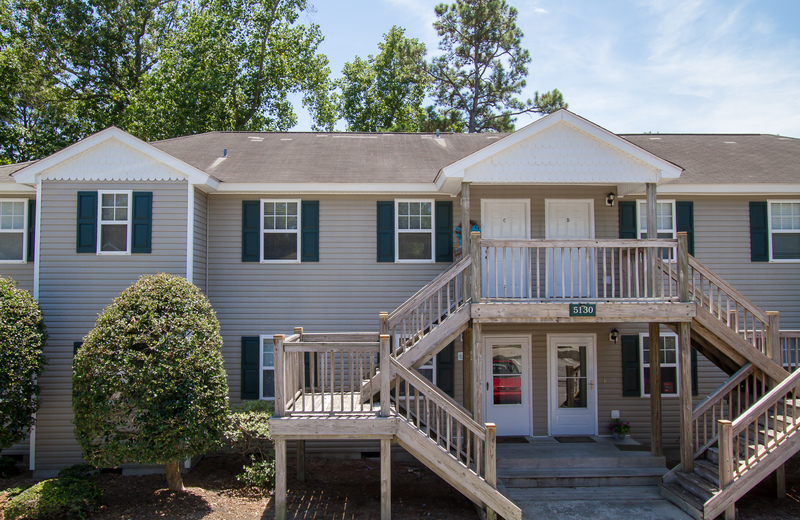 Second floor unit in desirable Tidal Oaks community. Two bedrooms, two full baths, combination living & dining space with pass thru window to kitchen, and home office that you can easily use as a 3rd guestroom. Kitchen has double sink, dishwasher, range, and refrigerator. Washer & dryer convey. Features include laminate flooring and carpet, vaulted ceilings, new water heater, partially covered rear deck with views of Hewlett’s Creek. 2 parking spots allotted. Beautiful 9th floor condo in popular Pelican Watch complex. 1100+ sqft unit was renovated in 2017. Timber wood plank porcelain tile flooring throughout. Kitchen offers slate appliances, granite counters, wine rack, breakfast bar. Dining area included in living room, which has sliding doors to balcony. Separate laundry room. Two bedrooms upon entry, share full bath in hall. 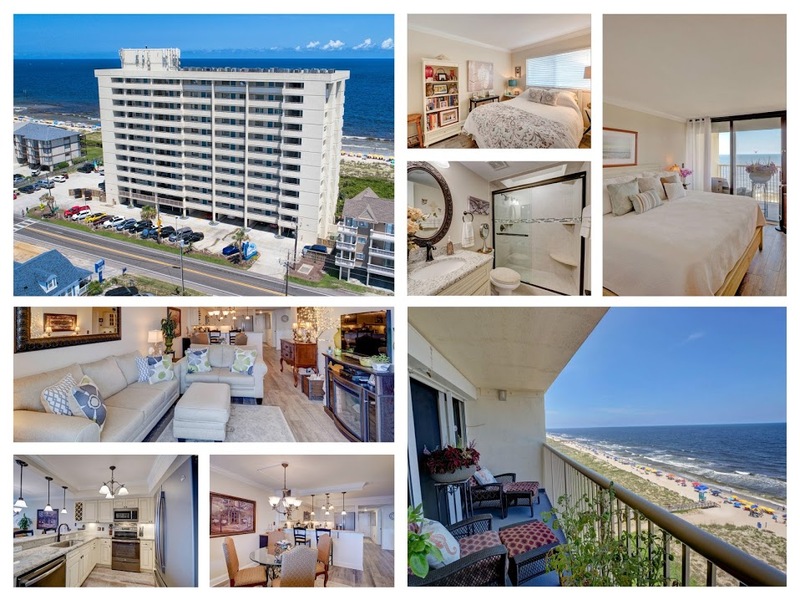 Master has attached bath with walk-in shower, access to 6x24’ balcony & ocean views.